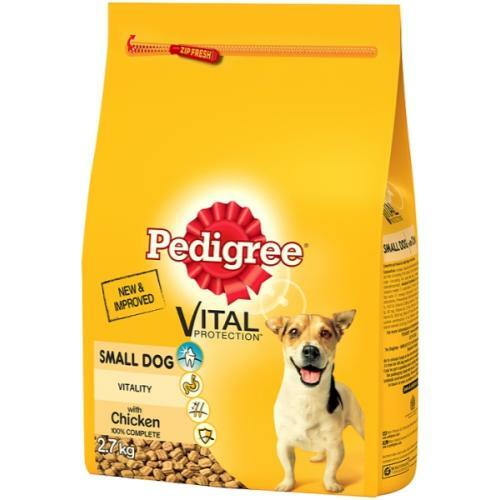 Pedigree Complete Vital Protection Chicken Dry Small Dog Food has been especially formulated to support the high energy needs of small breed dogs the Pedigree Complete Vital Protection Chicken Dry Small Dog Food the recipe is made using high quality meat proteins to keep your dog full of bounce. Providing nutrition to four key areas Skin and Coat, Immune System, Digestion and Oral Care this complete meal helps keep your dog in tip top shape so that you can watch their personality flourish. The specially shaped kibble also helps clean your dog’s teeth so that their bright smile shows that the Pedigree expertise is working on the side.